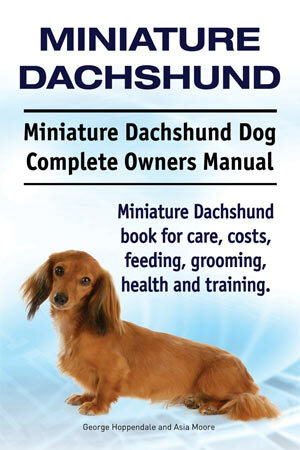 Welcome all of you Dachshund fans! I am Sampson, the lovable little Dachshund. I thank you for coming back to visit me. First of all, let me tell you that this internet fame, is well, it’s tiring this little Doxie. When my Mommy carried me out of bed this morning and brought me downstairs, I fell right back asleep again until 10a.m.! 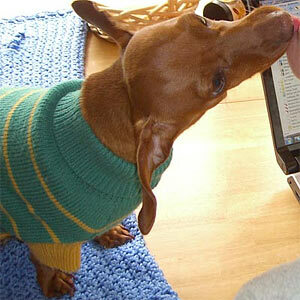 Well, it seems my Dachshund popularity is growing. I had such a busy morning with an almost constant stream of visitors. The first visitor was Old Man Fernando. He came by, but I didn’t hear Mommy announce him. So when she opened the front door, I instinctively launched with my Dachshund guard dog posture and barking, I nearly scared the poor fellow to death. He immediately turned and ran (as fast as he could) to his home. So much for that visitor! Oh my, I felt terrible. He must think I’m terribly rude. The next time I see him I’ll have to be sure to explain my uncivil behavior. I’m sure he’ll understand. After all, guarding is, a priority for every dog. The next visitor was Irena who came by to give me hugs and kisses and congratulate me on the website. She lives next door and she is Fernando’s ‘person’. Then two of the cats that live on the other side of us came by to congratulate me as well. The first cat visitor was the beautiful Siamese. Ah, she is a beauty. If only I could get up the nerve to talk to her. I get speechless every time I see her. Why, I don’t even know her name. If she reads this, maybe she will contact me on my Face-book page! Perhaps I can send her an anonymous Valentine. Then, the last visitor, Little Bit came by. He is one of the other cats that lives next door. He has no tail…ouch! I heard he was born that way. We don’t really talk to each other. He just walked by and gave me a nod of his head. I try to avoid him when I can. He’s always getting in trouble, you know, a bit of a ‘scrapper’. Why, Fernando has told me that they have a whole house full of ‘people’ to take care of them. And, they actually live with dogs! I know, can you believe it….cats living with dogs!?! Pop Pops and Mommy have told me that they had dogs and cats that lived together years ago. Personally, it’s too much for this mini Dachshund to wrap his mind around right now. Ugh, time for a nap!